The I.D. R Pikes Peak has wrapped up its next record. 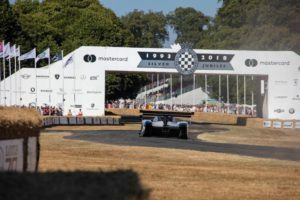 Romain Dumas set a new record for electric cars of 43.86 seconds in Volkswagen’s first fully-electric racing car at the Goodwood Festival of Speed. 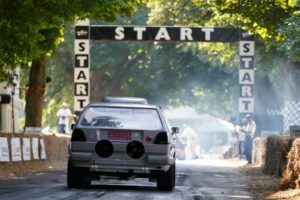 Following his record-breaking exploits at the legendary Pikes Peak International Hill Climb just three weeks ago, Dumas beat the previous fastest time for electric cars on the Goodwood Hillclimb, which has stood since 2013, by 3.48 seconds. The all-time record still belongs to Nick Heidfeld. The former Formula 1 driver completed the 1.86-kilometre route in 41.6 seconds. He was at the wheel of a McLaren-Mercedes MP4/13 Formula 1 car in 1999. The homage to motorsport on the Duke of Richmond’s estate is the largest event of its type in the world. This year’s starter list once was once again a who’s who of motorsport. Dumas in the 500-kW (680-PS) I.D. R Pikes Peak was joined at Goodwood by Hans-Joachim “Strietzel” Stuck and Jochi Kleint in the 480-kW (652-PS) 1987 Volkswagen Golf 2 Bi-Motor Pikes Peak. Other big names in action included Giacomo Agostini, Derek Bell, Emerson Fittipaldi, Mika Hakkinen, Tom Kristensen, Nick Mason, Sébastien Ogier, Richard Petty, Walter Röhrl and Sir Jackie Stewart.